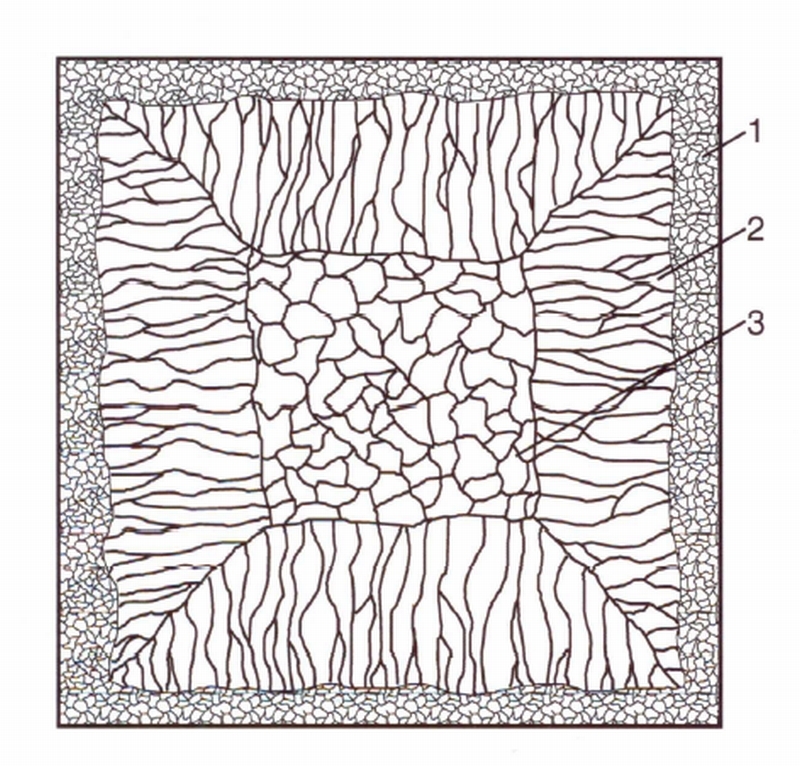 Final result of alloys solidification processes. Exogenously growing crystals can be found in the first solidified cast body as grains with preferred longitudinal stretching (columnar crystals, column-shaped crystals); endogenously growing crystals turn into globulites (equi-axed crystals). As illustrated in Fig. 1, the casting body macro-structures can also be attributed to a couple of types. As shown in Fig. 1, in case A the casting body properties are basically isotropic, the structure exclusively consists of globulites. In case B, only columnar crystals can be found, all properties are anisotropic. The easiest way to show the casting structure development is using the illustration of a block. As shown in Fig. 2, which also comes closer to reality than what is shown in Fig. 1, it contains columnar crystals and globulites. Three zones can clearly be differentiated: the outer globulite area 1, the column-shaped crystal area 2 and the interior globulite area 3. The classic nucleation theory is used for explaining the outer globulite area. According to the theory, the molding material draws heat from liquid metal when is it poured into the cold mold so that there are supercoolings at the mold wall which result in nucleation. Due to the mold wall and floating foreign particles in the melt (see Incolution), an increasing number of nuclei develops heterogeneously which turn into round-shaped crystals. Due to released solidification heat, supercooling is removed and the growth is slowed down. 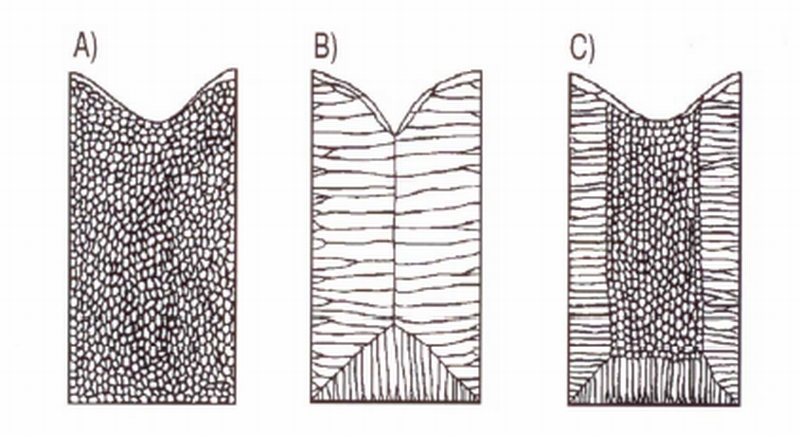 The subsequent columnar crystalgrowth is explained as follows: Crystals, which are favorably oriented to the heat flow and horizontally to the mold wall can continue to grow into the block, the remaining crystals “grown until they die” (quotation by S. Engler). The interior globulite area development occurs through constitutional supercooling, i.e. nucleation of interior globulites occurs heterogeneously in front of growing columnar crystals. This idea was qualitatively formulated in 1929 by G. Tammann and G. Masing. A second possiblity consists of a transportation of the casting from outer areas to the interior.